​Despite legal, medical, and social advances, new research suggests the majority of gay fathers and their children continue to experience stigma with potentially harmful physical and psychological effects. 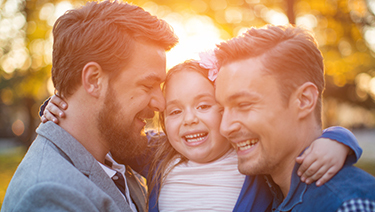 The February 2019 Pediatrics study, "Barriers and Stigma Experienced by Gay Fathers and their Children," analyzed anonymous, online survey responses from 732 gay fathers from 47 states who reported on a total of 1,316 children. Among the questions were whether the father and/or his child(ren) had been "made to feel uncomfortable, excluded, shamed, hurt, or unwelcome" in various social contexts. Children, who averaged 13.4 years of age, had entered their families in various ways: 35.4 percent joined through foster care and/or adoption; 13.5 percent with the assistance of a surrogate pregnancy carrier; and 39.1 percent through a heterosexual relationship. Almost two-thirds of fathers responding (63.5 percent) reported they had experienced stigma over the past year based on being a gay father. Most stigma had occurred in religious environments (reported by 34.8 percent of fathers), while about one-quarter of respondents reported experiencing stigma in the past year from family members, neighbors, gay friends, and/or service providers such as waiters and salespeople. Nearly 19 percent of fathers reported that their child(ren) had avoided activities with friends for fear of encountering stigma. The presence of laws and policies that support LGBT populations in the state where the family lives reduced the experience of stigma for these families. Prior research has shown that the amount of community support provided to members of sexual minorities is related to the well-being of lesbian and gay adolescents, adults, and children with lesbian or gay parents, including rates of suicidality and psychiatric disorders. This study's authors encouraged pediatricians caring for children and their gay fathers to include discussions about potentially stigmatizing experiences to help families learn strategies to counteract its harmful effects. As leaders in their communities, they said, pediatricians also have an opportunity to help oppose discrimination in religious and other community institutions.